Nowhere in Britain is more closely associated with a form of language than Liverpool. Yet the history of language in Liverpool has been obscured by misrepresentation and myth-making and narratives of Liverpool’s linguistic past have scarcely done justice to the rich, complex and fascinating history which produced it. Scouse: A Social and Cultural History presents a ground-breaking and iconoclastic account which challenges many of the forms of received wisdom about language in Liverpool and presents an alternative version of the currently accepted history. Ranging from the mid eighteenth century to the present, the book explores evidence from a host of different sources including the first histories of Liverpool, a rare slaving drama set in the port, a poor house report which records the first use of ‘Scouse’ (the dish), nineteenth century debates on Gladstone’s speech, the ‘lost’ literature of the city, early to mid twentieth century newspaper accounts of Liverpudlian words, idioms and traditions, little-known essays which coined the use of ‘Scouse’ to refer to the language of Liverpool, aspects of popular culture in the 1950s and 60s, the Lern Yerself Scouse series, and examples drawn from contemporary literature. In addition the analysis draws on recent developments within the fields of sociolinguistics and linguistic anthropology - particularly with regard to the study of language and identity and the relationship between language and a sense of place – in order to provide a radically new understanding of ‘Scouse’ in terms of its history, its representation, and its contemporary social and cultural significance. Can there be an archaeology of sound? Tony Crowley raids newspapers, journals, letters and his own memories in an attempt to trace the history of a manner of speaking. In doing so he tells the story of the rise and fall of a whole city, a way of life. This is an eccentric, creative, quixotic, scholarly and ultimately emotional book that is unlike anything else I've ever read. 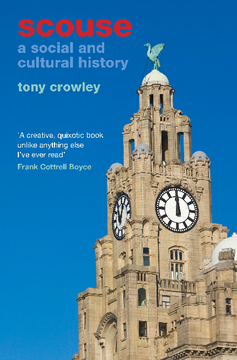 Tony Crowley’s Scouse: A Social and Cultural History. Rather than a dialectological list of features, Crowley gives a fascinating account of the enregisterment process of Scouse, leading to its status as perhaps the top recognizable variety of all of Britain today. Rather than a dialectological list of features, Crowley gives a fascinating account of the enregisterment process of Scouse, leading to its status as perhaps the top recognizable variety of all of Britain today. Scouse offers a compelling account of how a city’s identity is formed through its language, drawing on a rich range of sources and generating a wealth of unexpected insights. Thoroughly researched using an impressive range of sources from antiquarian to contemporary creative writing; and written with fluency and authority. This is the nearest thing to a definitive history of scouse. An enthralling book... Tony Crowley has written a book many of us have wanted to read for a long time. Tony Crowley’s searching book starts with a rigorous study of historic sources, their modern interpretations and the insights of contemporary linguistic theory. The conventional view has been that, in the 1840s, a warm front of Irish immigration came up against an unyielding mass of Lancashire grittiness, rough and dour. So superficially appealing has this explanation been that it’s gone largely unquestioned until now, even by serious historians. Crowley places the emergence of a distinctive Liverpool accent a great deal earlier – but that of “Scouse” as comparatively recent. In doing so, he opens up much wider questions of place, class and identity; of how people are seen and come to see themselves. Tony Crowley is Professor of English at the University of Leeds. Born and bred in Liverpool, he has taught at Oxford, Southampton and Manchester Universities. He was the Hartley Burr Alexander Chair of the Humanities at Scripps College, California (2005–13), and is a Fellow of the English Association. His previous books include Scouse: A Social and Cultural History (Liverpool University Press, 2012), Wars of Words: The Politics of Language in Ireland 1537–2005 (Oxford University Press, 2005) and The Politics of Language: The Standard Language Question in Cultural Debates (Palgrave, 2003).